My family doctor ordered an X-ray of my hip, and the result was obvious. I needed to see a hip specialist. I was then referred to Dr Benjamin Domb. During my first visit, Dr Domb, impressed me with his professional knowledge, courtesy and kindness. He repeated the X-ray, and adminstered an injection to reduce my constantly increasing pain. After two weeks, during my second visit, the decision was made that I need to undergo a hip surgery. Dr Domb explained the whole process in detail, and assured me that everything will be OK. The surgery went well, during which, Dr Domb replaced my hip, using sophisticated medical technology, and leaving only a tiny scar line on my side. Dr Domb, is a great, caring man, with impressive professional knowledge, skills, and great character. He is a perfectionist, paying attention to every detail during the whole treatment process. Thanks to Dr Domb, three months after the surgery, I feel great, and the pain is completely gone. 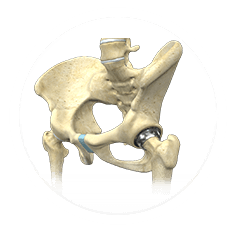 I do not feel any lack of performance, or limitations due to an artificial hip. When walking to the doctor's office, it is hard not to notice a wall full of his diplomas, achievements, and rewards, and I am a living proof of the knowledge, Dr Domb was recognized for. Thank you so very much for changing and improving my life."